So how do you choose the perfect dairy free milk substitute for your allergic child? There are a few factors to weigh, but in the end, it’s all good because we have so many great options these days. I’ll try to simplify this for the overwhelmed, which is why I won’t talk about the expensive flax, oat & hemp milks and obviously not the nut milks either. In my fridge right now, I have 4 options: Original Silk Soy, Vanilla PureCoconut, Plain Rice Dream, Plain Soy Creamer. Plain soy & rice are for drinking, PureCoconut is for baking, creamer is for ice cream making. Keep reading if you want the why! I’ve recently switched to using Silk PureCoconut exclusively in my baked goods & I’m in LOVE. I used to use soymilk, but I was never really happy with the final product. I could taste the soybeans a mile away. I’ve switched over completely & it’s just awesome. The fat content is perfect for muffins & cookies. The faint coconut flavor in the final baked product gives a buttery essence. This stuff makes the best pancakes poured straight into Bisquick mix. Silk PureCoconut is a coconut beverage and not the same as coconut milk from the can. Canned coconut milk is very thick, nearly solid with fats when chilled. Silk PureCoconut is thinned out with water and fortified with vitamins. Second best option is soymilk. I’ve tried rice milk in baked goods, and haven’t had very good luck. I think it’s chemically about the same as adding water! There are many factors to consider when choosing the right milk for drinking. Nutrition is obviously the big one. 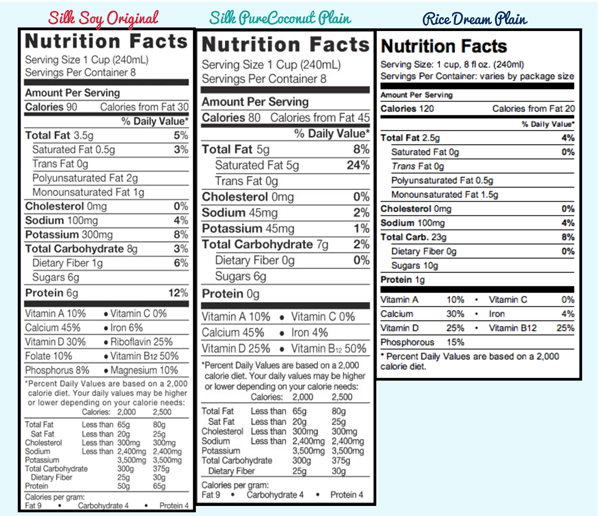 So, lets look at the side-by-side nutrition comparison of plain versions of soy, coconut & rice. In general, most dairy-free milks are fortified with calcium & other vitamins. Some have a little more, some have a little less, but they’re pretty equal at the end of the day. For calories, rice milk is the highest. This makes sense because rice is a carb, but it doesn’t have much protein. For fat, coconut milk is the highest. This also makes sense because coconut has a lot of natural oil, but it doesn’t have any protein. For protein, soymilk is on top. Again, makes sense because soy is a bean and it’s middle of the road on fats and calories. So how do you choose? Well, like nearly everything I happen to believe moderation & variety are the best options. My kids don’t like drinking coconut straight. It’s just too thick and strong flavored for them, so I just use it for baking. So getting down to soy and rice, they much prefer drinking rice. It’s cleaner tasting. Problem is, nutritionally, there’s no protein and the fat is all added oil . Eeks! Well, think about it, rice is naturally fat free. So we’ve compromised, and do soy with cereal or cookies and rice for drinking at mealtime. Seems to work for us. Many years ago (awww! look at those little bugs!! ), when the market in dairy-free milks started exploding ( yeah for marketplace competition—prices have dropped, quality has improved, innovation has brought new options and flavors to market! ), I realized there were so many great options beyond the boxed Westsoy I was using. I went to the grocery and bought a bunch of options and brought them home for the girls to try in a blind taste-test. We did it up, complete with score cards. They loved it. 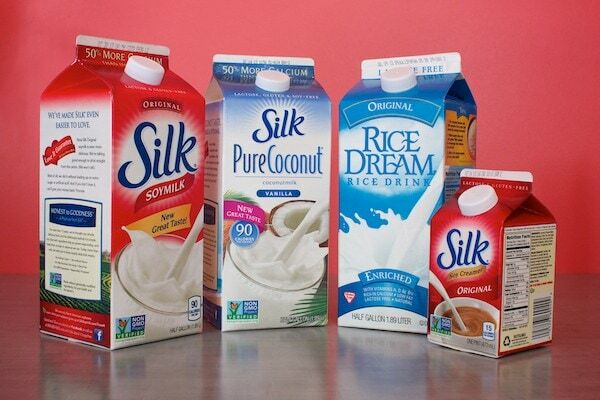 Turned out, we all chose a generic soy milk as the favorite, which really surprised me & made my budget happy. Have fun! P.S. The pink background in the top picture is the new coral color I painted my kitchen walls. Isn’t it awesome! Previous Post: « Free EpiPen Coupons! Love this post! I will try baking with PureCoconut. I use soy milk, and like you, I am not totally pleased with it, but it’s better than Rice Dream in that situation. The taste test is a good idea, too. My two-year-old might be a little young for it (he likes everything), but maybe in a year or two. I love that you suggested things that are at my grocery store, that I either use or have seen before. And your kitchen color is gorgeous! Thanks again for what you do here! We use Kirkland brand Organic Rice Milk currently, which my youngest (also allergic to peanuts) will drink but my oldest turns her nose up to. I’ve been looking into alternatives (hoping to please everyone! ), but had some concern about Carrageenan which is found in the ingredient list of most non-dairy alternative milks. It seems that there is some concern over carrageenan’s inflammatory properties in recent literature. I was wondering what your thoughts are? Thanks for any input you might have! Melissa, I look all the weird ingredients up too! For me, it’s risk management. There are enough ingredients out there that I know will cause a problem now (milk, egg, nuts = anaphylaxis), that I can’t stress too much about all the little things that may potentially cause a problem someday. Someone once asked me if I was worried that giving my kids soy could cause early puberty. Well, given the options here…I think getting my kids to puberty alive is worth the possibility of puberty 6 months early. Carrageenan is one of those “jury is still out” sorts of things, where some studies in animals with massive doses of the stuff show some microscopic GI changes, but most studies show it doesn’t. So, I’ve put it in my “Do Not Worry” file. But again, things like this argue for diversity & moderation. Rice Dream doesn’t have carrageenan. We drink mostly whole foods 365 organic almond milk. No carrageenan, middle of the road for fat and protein. My son has gotten used to the unsweetened. It works fine for pancakes and waffles. I don’t bake too much, but when I do, we use coconut oil to replace butter so that seems to make up for any fat that might be missing in the milk. I just tried making homemade cashew milk (lots of protein and fat!) this week. I loved it but my son and husband not so much. I didn’t strain it in a nutbag so I will try it that way once and of they don’t like it it will not be worth all the work. Forgot you were nut free, too. Sorry! 🙂 That’s ok! I once accidentally bought the Silk Almond Milk instead of the coconut. The boxes look really similar. Thank goodness I caught it before serving it! Anyway, I tried it, just for my own education and I liked it a lot. If we could do nuts, that’s probably what I’d choose too! Oh, and don’t Google “nutbag”. You won’t find what you’re looking for…yipes! We used to drink Silk and use Silk PureCoconut all the time but don’t they have an allergy warning for nuts (tree nuts) used on the same lines the original and coconut milk are processed? My kids are allergic to dairy/eggs/peanuts/tree nuts. Good question Liz. This one I’ll leave up to your discretion. Coconut is not a nut, so that’s not a concern to me. The almond warning is in the Land of Fuzzy. You can read their statement on allergens here http://silk.com/faqs or give them a call here 1-888-820-928. I called a while back & was told they have extensive measures to prevent cross contamination during the ultrapasteurization process, cleaning the machines between products, running water through the line & testing that before adding product, then testing the new product before during & after ultrapasteurization. And computerizing the whole thing to reduce human error. We’ve never had a reaction to Silk in any of the kids, 2 of ours have almond allergy. So I’ll leave it up to you. If you check the web, there are reports of reactions to all sorts of things, including SIlk. When I was researching this, I even found postings by a quacky allergist from Michigan claiming milk protein in Silk Soy, reporting anaphylaxis after touching Silk Soy (but don’t worry…he’ll cure you of your milk allergy with oral immunotherapy at his office for a “small” fee). Good luck! Thanks. I am going to call them and listen to their allergy precautions. Silk Milk was always our favorite and WalMart sells it in those awesome two packs. Thanks for the info – I figured was what you were going to say. Aren’t the “made in the same facility as / processed on the same lines” not required by law so there might be things we eat that should have those warnings but don’t? Nice blog. It reflects you. You just made my day Leo! My son loves Hemp Milk from Living Harvest. Like you, I diversify what dairy free milks we drink. I love coconut and sunflower for baking, and rice milk for cheese sauces and more savory dishes. I do use the rice milk sparingly since hearing about the arsenic warnings, but I try not to sweat it too much! Oh my goodness, I’m so happy to have seen this post! I was just discussing the nutritional information of the milk-alternative yogurts. I never thought about the coconut milk for baking. I am absolutely going to try that! Thanks so much for sharing your expertise. 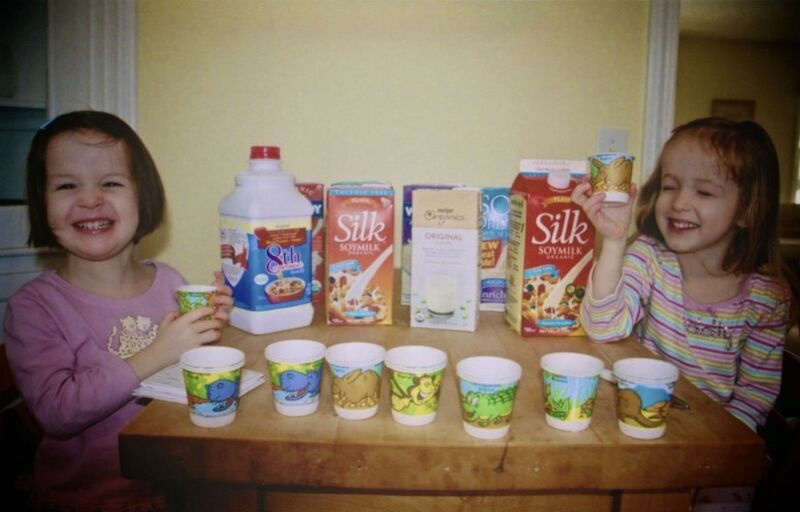 We have been using Silk Soy milk for our Dairy/Peanut allergy toddler for about a year. Today he had a severe allergic reaction. Hives, swelling, wheezing, vomiting. I couldn’t figure it out, and then I remembered him drinking the soy milk out of the brand new carton I just opened. I thought, no, it couldn’t be. I visited their website and saw the “shared lines” bit, which made me do a little searching to find that lots of hypersensitive dairy allergy kids have allergic reactions to Silk. Needless to say, I’m livid right now and we will not be drinking Silk anymore.